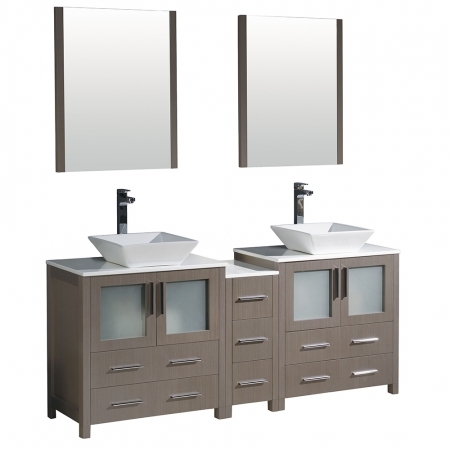 For modern style and convenience, this double sink vanity is the best choice for the bathroom. The two sink bases are separated with a three drawer bank that provides shared storage and extra counter top area. 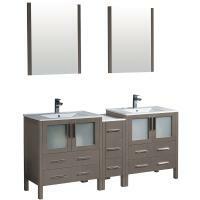 Each sink base has a double door cabinet with an interior shelf and two nice sized drawers at the bottom. There is room for everything within this piece. 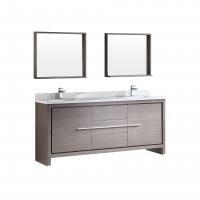 The wood material has a gray oak finish that is accented with chrome hardware pulls. 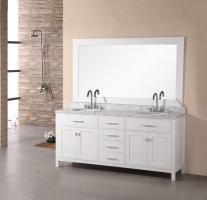 This selection has tapered edge vessel sinks made of white ceramic that adds to the updated look. The two matching mirrors add great space for personal viewing.